The Federal Government is paying more attention to the crisis that has ravaged some communities in Kaduna state. Security operatives have reportedly being instructed to 'shoot at sight'. 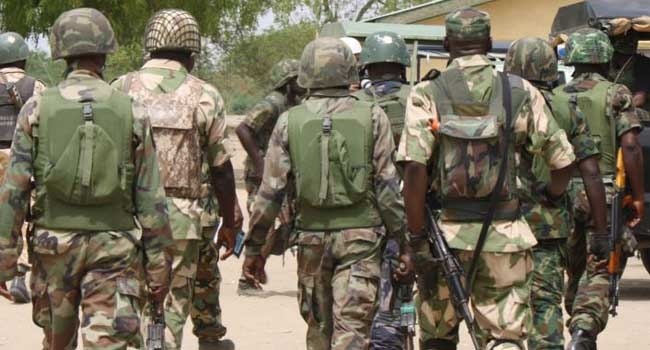 The Nigerian army on Tuesday launched Operation ‘Harbin Kunama’ in Southern Kaduna. The aim is to find herdsmen behind the incessant attacks on some communities in the area and to forestall further attacks. ‘Harbin Kunama’ means ‘Scorpion Sting’ in Hausa language. A source in Kafanchan, who preferred anonymity, confirmed to Bounce News that soldiers have already been deployed for the operation. He said the deployed soldiers have begun camping in Gidan Waya. Areas they are supposed to cover, according to the source, include: Kogoro, Godogodo, Kaninkon, and part of Kaboma. He said the soldiers have been mandated to enter the bushes and fish the attackers out. He said warnings have been issued to all communities within the affected areas, especially farmers, to avoid going into the bushes as the soldiers have been instructed to shoot at sight. Southern Kaduna have been hotbed of Fulani herdsmen attacks since May 2016. Their attacks have left over 200 persons dead and thousands homeless. The herdsmen’s latest attack was on Saturday last week when Christians were preparing to celebrate Easter on Sunday. The attack left no fewer than 13 persons in Asso village in Jama’a Local Government, dead. The incident, according to a source in the village, occurred about 7.30 p.m. when the herdsmen in large numbers invaded the community and started shooting sporadically.